This beautiful custom is all but unique to The Peak District & Derbyshire. Once known as ‘well flowering’, it is thought to have originated in pagan times. Did the remote hills of Derbyshire escape the waves of invasion by Romans,Saxons, Danes and Normans that swept other parts of Britain into new cultures and new customs? However well dressing began, it was banned by the early Christians along with all other forms of water worship – but the tradition refused to die. Tissington revived well dressing in 1349 after the village escaped a terrible outbreak of the Black Death that wiped out almost half the people of Britain. Barlow claims it started dressing wells in Elizabethan times, but many places (including Wirksworth around 1827) began ‘tap dressing’ when piped water first came to town. So what is it? 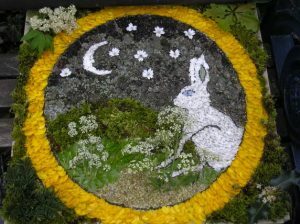 The ancient custom of WELL DRESSING is an offering of thanks for the continuous supply of water. This once pagan custom has since become adopted by the church and many of the designs now have a religious theme. At its simplest, it’s the art of decorating springs and wells with pictures made from growing things. The dressings are set in clay-filled wooden trays, mounted on a wooden frame. They take hours to complete, and townsfolk often work through the night to finish in the early hours of the first festival morning. The Wells decorated by Wirksworth dressers are pure examples of this traditional art. Using only natural materials, e.g. flower petals, moss, lichen, fruit skins, seeds and many more things, imaginative designs are created from a wealth of colours and textures. The ancient methods of construction used in Well Dressing ensure that none of the decoration need be manufactured or chemically treated. A large number of galvanised nails are hammered into a frame of wooden boards to give the coating of clay something to ‘key’ or cling to. The boards are soaked to prevent the clay from drying out too rapidly once it has been applied. Clay is ‘puddled’ or mixed with water and salt, and spread over the boards. The design is traced on to the clay by holes pricked through the paper and into the clay to mark the outline of the design. The outline is then marked in the clay with alder cones or black lichen. The first materials to be laid on to the design are dry or non-perishable such as lichen, cones, seeds, feathers, fruit peel and bark. Later, fresh leaves and flower petals are added such as lime, beech, ivy, yew, privet, hydrangea and evergreens. 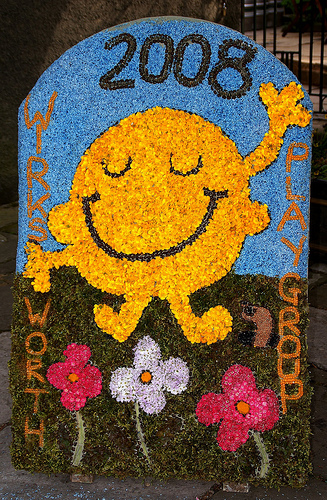 Well Dressings can be viewed in Wirksworth over the Spring Bank Holiday (the last weekend in May).